Milton Emanuel Sellick was born on 29th September 1919 at Maleny, Queensland, the fourth son and sixth child of a family of 12 children. The family left Maleny about 1924-25 to live on a dairy farm at Yandina, where he attended the State Primary School. After a while the family moved the Bergins Pocket, via Kandanga, where he attended Yabba Vale State School until moving to Montville to work on a fruit farm, until the death of a sister resulted in his return to Bergins Pocket. His upbringing was typical of the times and including a love of music, especially the singing of Deanna Durbin. He bought a ukulele he was attempting to learn to play. He attended Christian Endeavour held in a neighbour’s home, and also loved to swim in the local Mary River. Plans of working for his father to save money to travel to Western Queensland were put on hold as his plans changed with the outbreak of war in 1939. 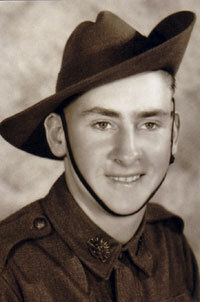 Putting his age up to 21, he enlisted in the AIF on 23rd July 1940, and began his training at Grovely. With other members of the 2/26th Battalion, he continued his training at Redbank and Bathurst before departing aboard the “Marnix” from Port Melbourne. During the fighting in Malaya he was wounded in the right knee, and along with many thousands of others taken prisoner on 15th February 1942. He departed Singapore in April 1943 as part of “F” Force. Unfortunately, he succumbed to Cholera on 6th June 1943 at Shimo Sonkurai, where he was cremated along with others and their ashes placed in bamboo cylinders and buried. On 15th March 1946 his ashes were exhumed by the Australian War Graves and reburied at Thambyuzyat War Cemetery, Burma.